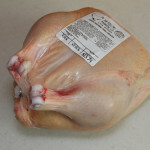 Just last week we finished up the last batch of chickens for the year. We ended 2013 with a small batch of Red Ranger meat birds. They’re a newly-available meat bird that’s a bit different than the average Cornish-Cross “NASCAR” chicken. The red rangers are slower growing, and more active bird. 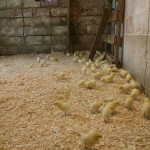 That means that they do a much better job of foraging around in their chicken pens for grass and bugs. I like it that they use the pasture more effectively and have less mortality than the NASCAR chickens. You’ll like the way that these new chickens taste. They’re very flavorful birds, which defy the “tastes like chicken” stereotype, with a skin that crisps up beautifully when roasted. I talked to a few other farmers who said that the red rangers were hands-down the tastiest chickens you could raise. I don’t disagree. From a practical farming perspective, these chickens have both good and bad points. Better meat quality, better foraging behavior, lower mortality, faster and more-consistent growth than pure-bred chicken breeds. 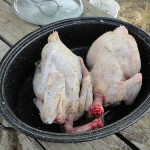 Higher chick costs, longer grow-out, larger weight “spread” than NASCAR chickens. On the left is a “normal” NASCAR chicken. In the middle is a male red ranger, and on the right a female red ranger. All three chickens were hatched the same day, lived in the same pen, and ate the same food. 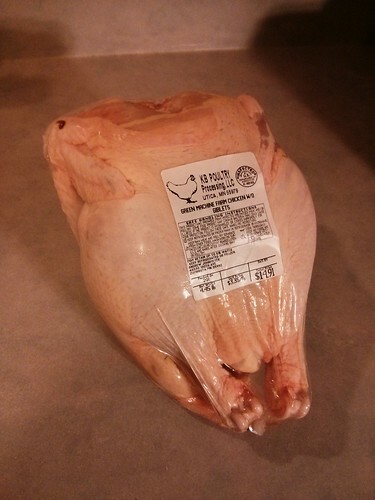 The NASCAR chicken weighs 7.5lbs. That’s 1/2 pound more than the other two chickens combined! Broken down to the cold hard numbers, we’d gross 53% more income by growing NASCAR chickens instead of the red rangers. The red rangers are better foragers, and should have a lower feed cost than the NASCAR chickens, as well as having lower mortality loss. But there’s no getting around the fact that red ranger chicks cost twice as much, and they take twice as long to grow. Time, after all, equals money and that means the red rangers are a costlier bird to grow. There is quite a difference in weight between the male and female red rangers. Normally, even a small amount of sexual dimorphisim is frowned upon in broiler production, but I haven’t yet decided that it’s a bad thing for us. 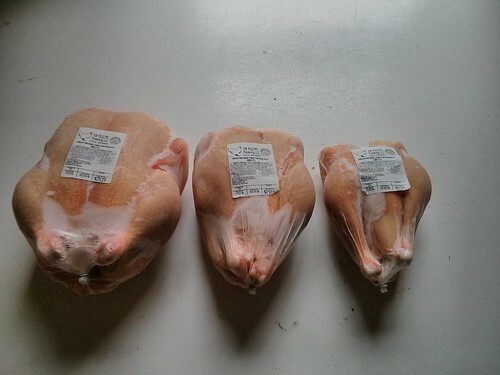 Because we direct market our chicken, we have a lot of different customers who like a different sized bird. It’s nice to have a little bit of variety to choose from in those cases. As this is our “experimental” batch of red rangers, we’ve left our price the same at $3.35 per pound. Hurry up and try one before they’re all gone! If you do get to try one, please let us know what you think of it! 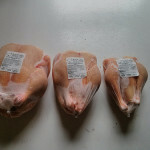 We’ll be looking for customer feedback to decide what chickens to raise next year. You mentioned that you grew the cornish and the rangers together and the longer grow-out time for the rangers, but I wasn’t quite clear on the butcher dates. In the second picture above, is that the rangers butchered after 14 weeks? Or were they butchered at 6-8 weeks like the cornish? I really like this blog, by the way. I’m learning a lot from your stories and experiments–keep up the good work! The rangers and cornish were both butchered at 11 weeks. We had an appointment with the butcher at 9 weeks, but I had to call and reschedule it after I weighed them and found that they were going to come up too light. 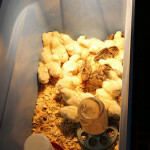 At 9 weeks the cockerels had a live weight 4.71lbs and the pullets were 3.16lbs. Hey Andrew, I’m reading your chicken posts for about the fifth time. Just some data from how they do it here, for interest’s sake. The label rouge chickens (a bit like your red ranger) finish at 81 days or so, sometimes a bit longer. The cornish crosses here finish way young. The only chicken farm that does them anywhere near here sends them off at 31 days! This is because they like their chicken weights at 1.8-2.0 kg which means small like your ranger carcasses above. We want to do bigger birds, so we’ll give the cornish cross a go. No supplier will deal with our small numbers but the nearby chicken farm can give us some from their incoming lot of 56,000. We’re going to try raising some chicks, and in three weeks we’ll try bringing in some of their 21-day olds to finish here just for comparison. Thanks again for these awesome posts. Thanks for the info Brent! I swear that our entire farm is made possible by the internet. I’m eager to see how your chicken-raising experience goes!